Carlene Thie father helped in the construction of the Sleeping Beauty Castle and her grandmother Kathryn Kilpatrick worked at the park for over 18 year. Carlene Thie also assisted legendary ride designer & Disney Legend Bob Gurr with his seminal masterpiece, “Design: Just for Fun.”book. Carlene Thie also produced a number of informative DVDs, including “Meet Bob Gurr” and a Disneyland 50th anniversary work. 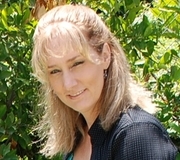 Carlene Thie is currently considered a "single author." If one or more works are by a distinct, homonymous authors, go ahead and split the author. Carlene Thie is composed of 1 name.